Holiday home alone for cats is bah humbug! 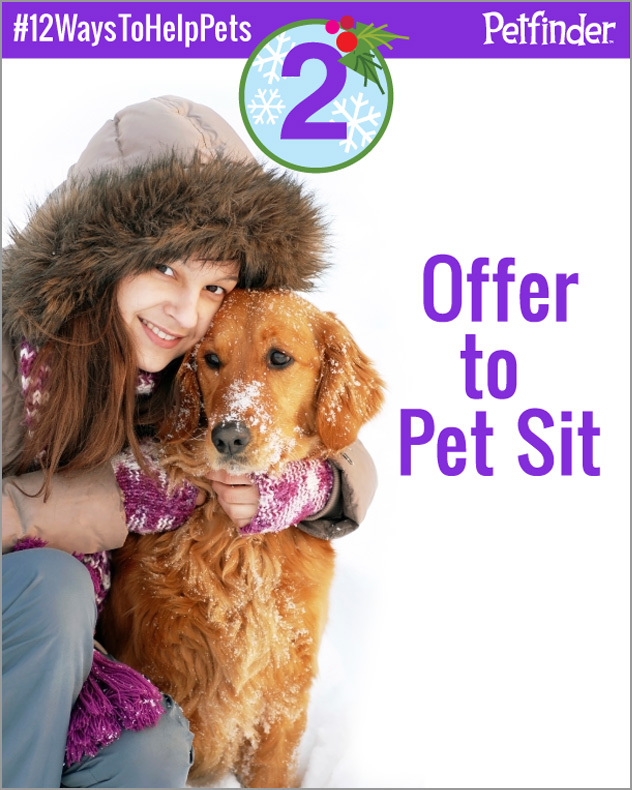 For the second of our 12 Ways to Help Pets posts we’d like to encourage you to pet sit for a neighbor or a friend. Learn why it’s important to be sure pets are cared for when their families are out of town in this post from regular guest blogger Layla Morgan Wilde of Cat Wisdom 101, then take the pledge to help pets for a chance to win! We can make jokes about cats being on Santa’s naughty list but leaving cats alone during the holidays is no laughing matter. A bored or stressed cat can engage in destructive behavior or worse. For many humans, the holiday season is a hectic mix of stress and fun. With overstuffed to-do lists, cats are often at the bottom of the list. During the holidays, think like a cat. While we’re having a jolly good time, cats have no concept of what a holiday is. For most cats the holidays are ho, ho, no! All they know is their owners are home less and acting differently. They spend more time away from home, shopping and socializing. There may be travel, houseguests or more entertaining at home. Cat guardians may be gone for days or even weeks. Homes may have new decorations, perhaps a Christmas tree, gift-wrapped presents, new foods and smells. What we call friends, neighbors or cat sitters, cats may consider interlopers in their home, which is a cat’s territory. Most cats don’t like changes in their environment like furniture may be moved but intrigued by new items like boxes and packages. New smells may entice or be off-putting. 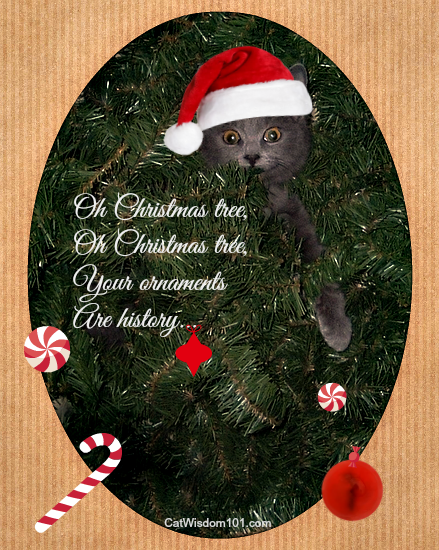 Being naturally curious, cats will sniff the Christmas tree, may try to climb it or even pee on it. 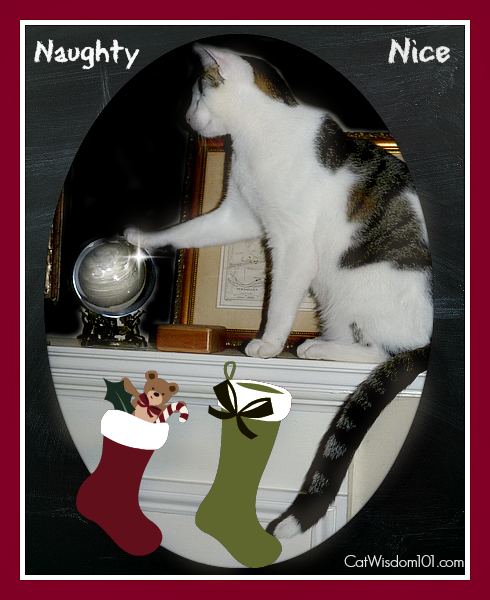 No cat paw can resist shiny dangling ornaments or shiny wrapped chocolates in a candy dish. They don’t understand why you’re angry for breaking Aunt Martha’s antique what not, or rolling mandarin oranges under the sofa. To a cat, everything is a potential toy. Well-socialized cats crave connection with their human family. They need mental stimulation to stave off boredom. Some cats require more attention during the holidays and like dogs can experience separation anxiety while pet parents are away. Being lonely or bored can lead to destructive behavior or litter box issues. Leaving a cat alone for even 24 hours can wreak emotional if not physical damage. Cats who have other feline companions are usually better off and less lonely than solo kitties but stress can create inter-cat aggression. The number of times I’ve heard people say, it’s fine to leave kitty alone with some kibble for the weekend is shocking. No, it’s not okay. Let’s put this myth to bed once and for all. Accidents can and do happen to cats and or the home in a blink of an eye. The following are a few real hazards that are well documented. Cats have an accident or get suddenly ill requiring immediate vet care. Water bowls get spilled, leaving nothing to drink. Toxic products can be pried open with paws. Windows can be opened, screens ripped open. Water pipes freeze and bursting, Fires in the home or nearby. Burglaries. Suffocation or electrocution from cords or decorations. Always unplug Christmas lights before leaving the home. The most dangerous decoration is tinsel. If swallowed, it can be lethal so just say no. Nothing spells holiday blues quicker than an emergency trip to the vet. The best solution is prevention. Keep cats stimulated and happy with adequate inter-active play, places to perch and hide, vertical and horizontal space to explore and scratch, varieties of fun toys and all toxic or unsafe items removed. When we play and snuggle with our cats it’s a win win. They help reduce our stress levels and happier cats makes everyone happy. Prepare for trips or vacations in well in advance. If you are going away for more than 24 hours arrange for proper cat care. That means fresh water and food twice daily, litter box cleaned out daily, interactive play time. Write detailed instructions of cat care, feeding, meds, individual cat’s personalities and preferences. Include your vet’s contact info and your nearest emergency clinic info. The time to arrange cat care is today and not the day before you’re leaving. If you have a reliable friend or neighbor to cat sit, great. If not, a professional pet sitter is worth their weight in catnip, not to mention peace of mind. Consider new tech gadgets like “nanny cams” for pets. Monitoring systems like Motorola’s Scout1 PET Monitor camera allows you to monitor your pets remotely from anywhere. Catch live action, record video or take snapshots. The holiday season is a time of showing love and generosity. Americans spend an average of $5 billion on their pets during the holidays. While some of these gifts will be appreciated by our pets, the best gift we can give our beloved cats is our time and care.